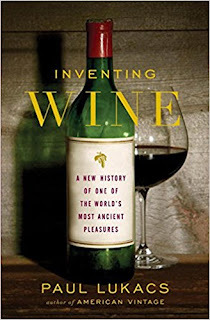 Mae's Food Blog: "Inventing Wine"
Traditional wines, it turns out, often are the product of careful research, studiously cultivated public image, and new technology -- "tradition" in wines is often not much more than a pretense of similarity with what was there before. "The idea of inventing tradition may seem strange, but many people in nineteenth-century Europe tried to link their rapidly changing modern world to a seemingly stable past. ... As historians have noted, this longing often led them to romanticize, distort, and even fabricate cultural legacies. ... Invented traditions worked precisely because they implied stability. The taste demanded in fine wine has developed enormously over time, Lukacs explains. The process of fermentation has developed in many ways, such as the 18th century discoveries of how to add sulphur and sugar to prevent spoilage and improve flavor. At the same time, new ways of bottling and aging wine included the introduction of corks, corkscrews, and robust bottles. Pasteur's and other 19th century advances in understanding micro-organisms were central to improving the process. Advances in refrigeration and temperature control, stainless steel vats, applications of microbiology, and other inventions have more recently changed the wine making process and enabled much higher expectations from both sellers and buyers. Practical wine makers, tinkerers, and academic scientists have participated in creating essentially revolutionary new ways to make and handle wine. Agricultural practices for growing specific types of grapes have improved, especially in response to epidemics of wine diseases. Attempts in France to designate wine-making standards and to specify standard regions was part of the reinvention of wine. The French definition of "appellation d'origine contrôlée (AOC)" has been imitated by other countries such as Italy, Spain, and Germany. In the last 40 years or so the total number of countries and wine-making regions has increased enormously, along with new attitudes and aspirations and many very fine newly-invented wines. Throughout history, changing level of consumer demands have driven many innovations, with consumers varying from rich connoisseurs to aspiring bourgeoise to poor winos. Growers, shippers, wine merchants and critics have participated in constant reinvention of wine and its meanings throughout history. While I found the first 100 pages of Inventing Wine a bit tedious and repetitive of material I've read elsewhere, the book picks up as it goes along. I especially appreciated the discussions of how the French ideas of terroir, or the role of local conditions, have given way to a broader view, which Lukacs calls "vision and varietal integrity." (p. 240) There's a lot to like in this book, and I was quite interested to learn that in my lifetime as a consumer of wine, my feeling that things have been changing a lot is not at all mistaken. We also like wine and read about it when a book looks interesting. I liked Cork Dork quite a but as it not only told about becoming a sommelier but about terroir and aging. As a wine lover, I'm interested in this. I too really liked Cork Dork.